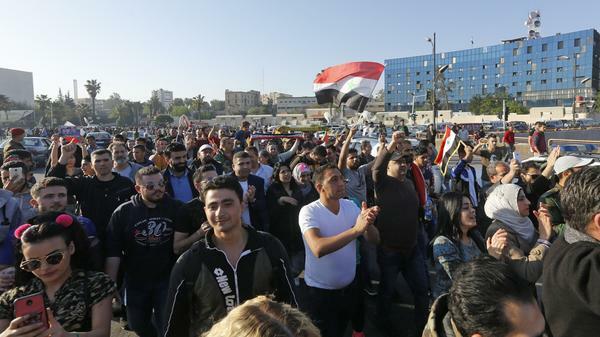 Syrians condemn the U.S.-led airstrikes, at a protest Saturday at the Omayyad Square in Damascus. "We are prepared to sustain this response until the Syrian regime stops its use of prohibited chemical agents," President Trump said in announcing the strikes from the White House. Russian officials and Trump have exchanged heated rhetoric since Trump began talk of a U.S. response to the alleged chemical attack throughout the past week. Russia threatened to shoot down any U.S. missiles launched at targets in Syria. Russia entered Syria's civil war in 2015 and has backed the Assad regime. Russia's Canadian embassy tweeted, "Washington & its UK/French allies should and will be held #responsible for this brazen act of #aggression and disregard of international law." Anatoly Antonov, Russia's ambassador to the U.S., said, "We are being threatened." He added in a statement, "We warned that such actions will not be left without consequences." In Damascus, "hundreds of residents began gathering in the landmark Omayyad Square of the Syrian capital. Many waved Syrian, Russian and Iranian flags. Some clapped their hands and danced, other drove in convoys, honking their horns in defiance," The Associated Press reports. "Good souls will not be humiliated," Syria's presidential office tweeted, as translated by The Associated Press. Iran, the Assad regime's other key ally, called the U.S.-led strikes an "aggression" that was "a flagrant violation of international laws and a disregard for Syria's right of national sovereignty and territorial integrity," according to Iran's semi-official FARS News Agency. Meanwhile, Western allies of the U.S. came out in support of the strikes. The U.K.'s defense ministry said Britain contributed "four Royal Air Force Tornado GR4s" to the effort. The planes fired Storm Shadow missiles at a facility where the U.K. said the Assad "regime is assessed to keep chemical weapon precursors stockpiled." U.K. Prime Minister Theresa May said the attack was "not about intervening in a civil war. It is not about regime change." She called the action a "limited and targeted strike that does not further escalate tensions in the region" but that will "send a clear signal to anyone else who believes they can use chemical weapons with impunity." In a statement later on Saturday morning in London, May said the U.K. was "confident of its success." French President Emmanuel Macron said France contributed to the U.S.-led Syrian attacks because the "red line declared by France in May 2017 has been crossed." Macron said the attack was "limited to the Syrian regime's facilities enabling the production and employment of chemical weapons." France's defense minister, Florence Parly, said that cruise missiles were fired and that an air raid was launched from multiple air bases in France, the AP reported. NATO Secretary-General Jens Stoltenberg issued a statement saying he supported the airstrikes. "This will reduce the regime's ability to further attack the people of Syria with chemical weapons," he said. The U.S., U.K. and France are all NATO members. The United Nations Secretary-General Antonio Guterres did not strongly condemn or praise the airstrikes, instead urging "all Member States to show restraint in these dangerous circumstances and to avoid any acts that could escalate the situation and worsen the suffering of the Syrian people." Turkey's foreign ministry said the airstrikes were "an appropriate response to the chemical attack." Turkey is a U.S. ally despite considering certain Kurdish groups in the region to be terrorists while the U.S. has backed those groups as a fighting force against ISIS.